MOSCOW, the Russian Federation (BulgarianMilitary.com) – The Russian crews of the strategic bombers Tupolev Tu-160, the Antonov An-124 military transport plane and the Ilyushin Il-62 long-range aircraft, who arrived in Venezuela on 10th December, held a joint flight training with Venezuela’s Air Force, at the airport located in Maiquetía, the Bolivarian Republic. This was reported yesterday (12the December), by the information and mass communications department of the Russian Defence Ministry, learned BulgarianMilitary.com. The statement of the Russia’s MoD says that the training aimed at exchanging experience in preparing the Russian and Venezuelan crews, who have examined the area by performing flights near Maiquetia Airport, through which they studied the cooperation issues together with the flights’ commander and the terminology of radio communication. 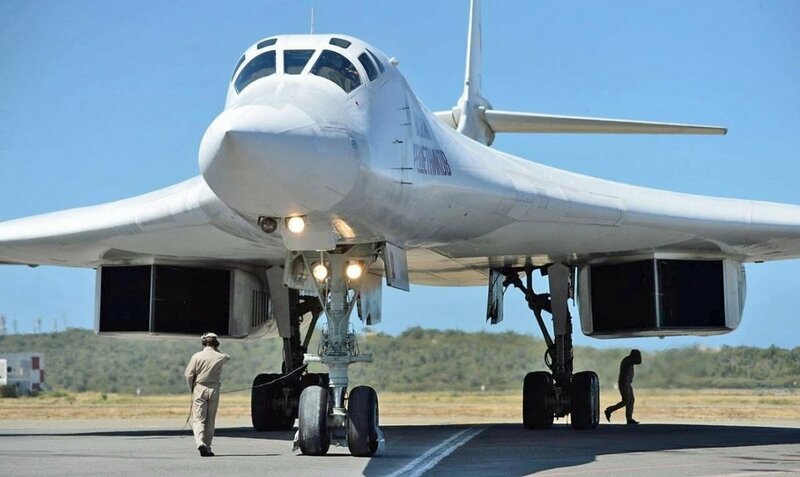 The press service also announced that during the international visit of the Aerospace Defense Forces’ delegation to Venezuela, the pilots of the two Russian Air Force Tu-160 strategic bombers carried out a flight in the airspace over the Caribbean Sea for about ten hours. During the flight, in certain parts of the route, Russian aircraft were accompanied by Su-30 and F-16 fighter jets, part of the Venezuelan National Bolivarian Military Aviation. By performing these air tasks, the pilots of the both countries practiced air cooperation. On Monday (10th December), Russia sent two Tupolev Tu-160 nuclear-capable strategic bombers, a heavy-lift An-124 Ruslan cargo plane and an Il-62 passenger plane in Venezuela. They arrived in the Bolivarian Republic, covering a distance of 10,000 kilometers over the Atlantic Ocean, the Barents, Norwegian and Caribbean Seas, and shadowed by Norwegian F-18 fighter jets during part of their flight. Mike Pompeo’s statement about Russia’s Tupolev Tu-160 strategic bombers sent to Venezuela was determined as “totally inappropriate” and “rather undiplomatic” by Kremlin. This was told the reporters by Russian Presidential Spokesman Dmitry Peskov, who pointed that the U.S. President Donald Trump also could evaluate Pompeo’s words, and an evaluation will follow in the future. “Moreover, it is not appropriate for a country half of whose defense expenditure would be enough to feed all of Africa’s people to make such statements,” Dmitry Peskov continued, adding that Russia’s search to build constructive relations with the U.S. is still ongoing and it expects Washington to respond in kind.